A lovely, large boondocking area just ~7 miles from Borrego Springs and right next to Anza Borrego State Park in SW California. NOTE/ NEW INFO AS OF Nov 2015. RULES have changed!! According to multiple reports from other boondockers, Anza Borrego State Park has acquired the land north of S22 around Peg Leg/Rockhouse Canyon Road and there are now new rules in effect. The new rules include 30-day stay limit, new doggie rules (dogs on leash, only allowed on park roads), no open ground fires and parking limited to 1-vehicle length from main road. The latter rule is the most restrictive and “may” mean that many of old campsites in this area are now off-limits. We have not personally been, so I am awaiting final confirmation of this before I update my review. If you choose to boondock here this winter please report back on the area in the comments section! Below review updated as of last stay Jan 2015. How We Found It: This is a fairly well-known boondocking spot in the area. We first discovered it when we met a guy who was staying there our very first year in the area. The RV forums also talk about it, as do other bloggers. Much of this area is still private land so there is no “official” info on the place, but it’s a well-known/well-used location. Nearest Dump/Water: Nearest dump at Borrego Palm Canyon campground inside Anza Borrego State Park ($8 fee). If you’re headed east there is also a dump at the ARCO station ($8 fee or free with gas/diesel fill up) at the corner of S22 and Hwy 86 by the Salton Sea. Access – 4.5/5 Very easy access for any sized-rig here although as usual a little extra effort is needed to access the best spots. Directions -> From Christmas Circle in Borrego Springs take Palm Canyon Drive (S22) east towards Salton Sea. Drive ~7 miles until you see Rockhouse Canyon Road on your left. Boondocking Spots-> Take Rockhouse Canyon road, up a short hill and past the “no trespassing” sign. Initial 100-ft of hill is paved, but road becomes reasonably firm dirt/sand after this spot. Boondocking spots are all over the desert after the sign, many off dirt spurs that depart from either side of the road. You’ll see plenty of cleared-out spaces with home-made fire-rings used by previous folks. Most people stay closer to the entrance (best Verizon signal here), but there are lots of really nice (and very private) spots further in. Some of the dirt spurs can be rather sandy/rough so check out the road before bringing in a big-rig. Nature – 5/5 Fabulous nature spot. You are in the middle of the desert valley surrounded by scrub with outstanding views of the mountains all around. Good and easy-access hiking on nearby Coyote Mountain too. Isolation – 4.5/5 Good to great isolation here depending on where you park. Only slight ding is this is a fairly well-known boondocking area and the Verizon signal is strongest near the entrance (closest to S22), so if you want a spot with good internet, you’ll likely get some rigs in your view. Pet Friendliness – 5/5 Another great pet spot. You have days-worth of hiking and exploring in the surrounding hills, plus lots of space to hang out in camp. Also this is mostly “scrub” desert so not alot of cholla around which is a big positive for paws on the ground. Summary: This is probably one of our absolute favorite boondocking spots. It has easy access, lots of space, gorgeous desert nature and simply fabulous mountain views all around. Although it’s fairly well-known amongst boondockers, Borrego Springs is a lightly-visited town so there are lots of opportunities to find space to yourself. In boondocking circles you’ll sometimes hear this called “Clark Dry Lake” although the boondocking area is actually up the hill before the dry lake bed. The spot is only ~7 miles NE from town, right off S22 on Rockhouse Canyon Road which is an easy dirt road that takes you back into the boondocking area. Front area (nearest S22) is super-easy to access and has the best Verizon signal, but is also the most popular. Further back on Rockhouse Canyon (nearer to the dry lake bed) the spots get much more isolated, but Verizon signal fades fast. We chose a spot a few miles down the dirt road which had very poor Verizon signal (just barely usable w/ our external antenna/amp), but really great privacy. 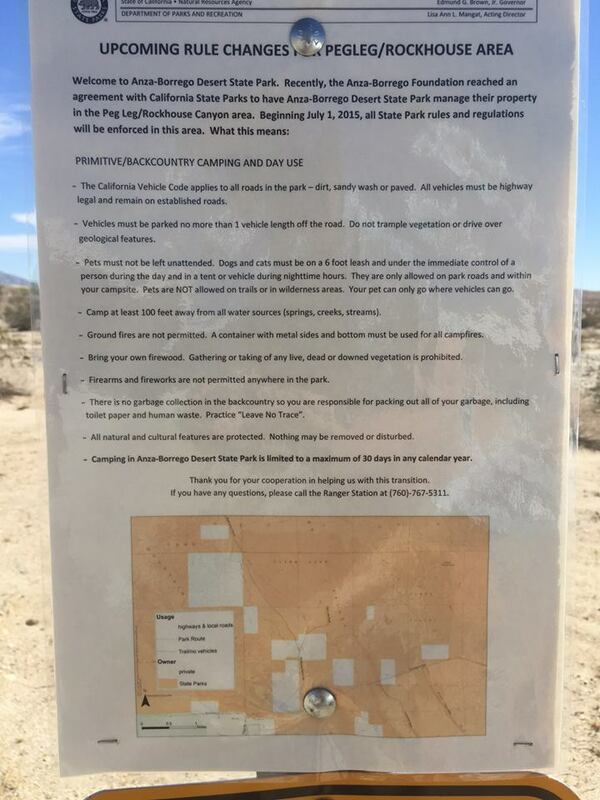 The area is on private land inside Borrego Springs so there are no “official” rules about camping (this also means no restrictive dog rules), but it could change at any time! The State Park has been in process (or in plans) to acquire this land for years so at some point in the future there may be a stay limit here and most likely some dog rules too (NOTE/ as of Dec 2014 there is no further update on this and it’s very possible the State Park ran out of money to do the acquisition. Either way the “old rules” still exist for now). Lots to do & explore in the surrounding area including the cute town of Borrego Springs plus no end of historic trails and natural beauty in Anza Borrego State Park. Overall a fabulous spot and one we’d come to again and again. Extra Info: No water or facilities (nearest dump/water inside Anza Borrego State Park). There are a few bars of Verizon LTE signal near the entrance (closest to S22), but poor to zero signal further back. Also some decent ATT 4G around, although it is spotty. Both are improved by boosting. Signal drops off fast as you move further away from S22, so if internet is important to you make sure you check out your signal before you bring in/park your rig. PEG LEG – This is actually right next to Rockhouse Canyon Road and is a great “beginner” boondocking area. It’s a large, flat and super, super easy-access “dirt parking” area right off Peg Leg road next to the Peg Leg monument. Cute little area and always rigs around. There’s a free book-swap in the mailbox. This is the same area where the annual Peg Leg Liar’s Contest is held. More info HERE. Free and no official stay limit. ANZA BORREGO STATE PARK – One of the unique things about Anza Borrego State Park is that they actually allow free, no-permit back-country camping anywhere within the state park as long as you stay within 1-vehicle length of the road, don’t trample vegetation and stay 100-feet away from any water source. There are lots of dirt roads leading to interesting spots around the park, but for those looking for a specific spot there is “official” free back-country camping at Blair Valley (could fit big-rig at the entrance), Yaqui Pass (easy, large area), Yaqui Well, Culp Valley, Sheep Canyon, Arroyo Salado, Mt. Palm Springs and Fish Creek. Download the State Park magazine for more info HERE. NOTE/ If you have a dog be aware that Anza Borrego State Park does *not* allow dogs on any trails or in any wilderness areas. So if you go back-country camping w/ pooch you can only walk him/her on-leash on the park road. OCOTILLO WELLS SVRA – This large off-road vehicle area east of Anza Borrego SP off Hwy 78 allows free 30-day camping anywhere within the area. It is also surrounded by BLM land. More info HERE. “Aerial” view of our very private boondocking spot from Coyote Mountain. You can see S22 snaking off into the distance in the far background. Another “ariel” view towards some nicely-spaced rigs near the back-end of the boondocking aera. Typical boondocking site. You’ll see clear-out spaces and fire-rings like this all around. Dirt-road section of Rockhouse Canyon Road. This is near the entrance with some rigs parked right off the road. Very approximate map of Clark Dry Lake boondocking area. Borrego Springs in on the left. S22 constinues to Salton Sea on the right. Thank you, Nina! I tried and tried to figure this all out from other blogs and just couldn’t find the spots. You are soooo helpful! Happy to be of help! Enjoy your stay in the area and let me know if you find any other sweet spots! You should get paid for this excellent and appreciated resource. Thanks. Aw, thanks. I’m in it for the sharing…and I usually get back as much as I share. So happy to give out the advice for free. Great! I like it all! LOVE big-rig boondocking advice – thank you! Glad it’s helpful 🙂 I’m hoping Karma will pay me back with many more boondocking opportunities in the future. We are leaving chula vista for boon docking in that area. Thanks for info. Can you tell me @ roads. We too are in a 40 Mh w/toad. Are there any roads/routes we should avoid traveling to the area. I was planning to take sr67 to sr78 to cr S3 to Borrego Springs. Wife and I retired and went full time 4 years ago at 51 and 53. Will start following your blog. Maybe we’ll meet somewhere “on the road”. No, I wouldn’t go that route. The ONE road I’d advise to avoid is the stretch of 78 right after Julian (called the “banner pass”). This pass doesn’t allow big rigs and frankly, I wouldn’t want to drive it in the big-rig anyway. So…instead of that I’d recommend going north at Santa Ysabel (so take 78 to Santa Ysabel, then turn north on 79 until you hit San Felipe Road). At that point you have a choice. -> You can take San Felipe to S22 directly to Borrego via the Montezuma Pass. It’s a steep pass, but we were fine taking it w/ the big-rig. -> Or you can take San Felipe back to 78 and recapture your original route (so basically you just do a big loop to avoid the Banner Pass). We took 78 east from Julian with our 35′ MH and Jeep toad to Borrego Springs without problems. Pulled over a few times to let faster traffic pass. BTW, fantastic apple pie a la mode at Julian Pie Company!! Thanks. Left the campground a little while ago. Unfortunately having mechanical problems and are on the side of the road outside Jamul. We’re headed to cummins, so we get a few day delay it looks like. Maybe we can meet somewhere while we wait. I’ll touch base when wedge the rig off the road. Bummer! Hope you get it repaired easily. Thanks. It looks something to do with the inverter/alternator. Cummins El Cajon 8:00 am. Will have the day off while we wait before we get to head to Anza. Would love to meet and share some stories if you guys have time tomorrow. Just tell us where to meet you and we’ll swing by. Maybe we can share some spots you guys would enjoy. The wife is a photographer as well. You can access all our albums at the top left of the page, but it is 4 years worth from Fla to NW Maine to across the south and up the coast to Alaska. There’s also photos from our 7 months in Yellowstone this past summer. Peg Leg Pete seems to be controled by the State Park System. They gave my friend a notice to leave as he had stayed there 30 days (that is the yearly limit). We are checking in to see if that is really their land as a local said it was privately owned. Will let you know when we find out. The other option he used (he is down there building a solar plant) is that corner you marked off on Henderson Rd, S22 and Peg Leg Road. That seems to be fine and used often. Interesting. As far as I know Peg Leg has always been private, but last year we heard rumblings that the State Park was looking to take over some of the area around there. They even came to another boondocker friend of ours and warned him that his rig would be on State Park the following year and so subject to stay limits. If this is true it will affect alot of boondockers who look to spend most of winter in the area. Thanks for the info and DO let me know what you find out! Just visited your blog from see a post of your on IRV2 (which I use for info all the time) Great information on your blog. My wife and I love driving 395 to Reno and back from our home in Ventura. Have to tried the beach rv parks in Ventura County yet? No we haven’t been to Ventura yet. We may do a coastal run next year so could be in the cards for that timeframe. Are any of the parks there dog friendly (I.e. Allow dogs on the beach)? Here we sit off S22 at the Clark Lake bed area at a beautiful spot and a great sunset tonite. Your description is creepy accurate. Down to web coverage. We scouted in the car … amazing job. Thanks very much! Excellent! Glad you found the spot and are enjoying it as much as we do when we go there. Sorry we couldn’t join you for margaritas! Oh bummer! Thanks for that info JimmyAndPammy. I’ll update the blog post. We are planning on spending part of the winter in Borrego. This will be our first winter full time. Where can I fill up with water before boondocking in this area? And refill again after dumping? We sure would appreciate you input on this. There is water at the state park campground, right next to the dump there. Hi…coming out that way in mid-Aug (2015). Years ago friends and I drove out to a road (Anza B) that went up one of the hills and we had perfect night sky for star gazing. Now (many) years later, my friend and I want to go there and I cannot remember how to get to that road. It went up a small mountain/hill and we parked just off the road and had a fabulous view. Do you happen to know where that is? Or a better road? Just looking for a nice spot up a hill to pull of the road and watch the night sky. Thank you! I just returned from Borrego Springs and thought you may be interested in the changes to the boondocking possibilities there. Rockhouse road area for boondocking has been reduced by 70-80 percent. Parking is to be no more than one vehicle length from the road. This is due to the park now owning the land bordering on S22. Only a few small areas are still private. Access off of S22 east of Rockhouse has been reduced to a few acres no more than 200 feet off of the hwy. Signs posted in the middle of the access roads state foot traffic only. Also a maximum stay of 30 days per calendar year is now in force. This is super sad to hear, but not entirely unexpected. The State Park has been trying to buy that land for years. In fact two or three years ago the Rangers even came round to visit all the boondockers and tell them things were about to change. That year the land deal fell through, so it didn’t happen, but now it looks like it has finally passed. Anyone else in the area who’s seen this and can talk more about it, please post! And click on the link from Jerry if you want to voice your concerns. If anyone has a clearer pic of the map, please do send it to me! I also recommend writing the State Park HQ in Sacramento, the local Superintendent, The Borrego Springs Chamber of Commerce and the Borrego Village Association. Further any and all State representatives and Senators. I especially urge California voters to complain. The Park is in violation of it’s own charter. It is supposed to encourage primitive camping ( No hook-ups), not discourage. It also can not close roads which have been in use for decades to deny people access. After all, Parks are for people and all about access. Now they state that you must walk in those areas in violation of the Americans With Disabilities Act. This whole problem is a result of the virtual take-over of the Park by a booster group called The Anza-Borrego Foundation ( ABF). They are the ones who have bought these once-private properties and “gave” them to the Park to administer but only under their strict rules. ABF has been behind denying access to many areas of this huge park for years as they want to see it as a desert reserve rather than a park. One of their stated goals ( In their own literature) is to purchase all of the available land “within the park boundaries” so that it can not be developed by the owners. They are essentially trying to limit the growth of the village of Borrego Springs and “own” the political clout to do so. It is an outrage that can only be changed by political pressure from the voters and other visitors/users of the park. Don’t think that you don’t count, this can be reversed and ABF’s stranglehold of power can be overcome. Just left the area, it was our first time camping there, we went down Rockhouse Rd about 2 miles and pulled into a less populated area. We had plenty of space around us, did not notice any enforcement of leash rules and had to be super careful taking our Kitty out for her walk due to an overly excitable dog about 200 yards away that was roaming free most of the time. We then drove further along the road and saw only a few scattered, smaller RVs, a few well off the road. We did see a lot of signs prohibiting vehicle traffic. Camping areas near S22 were relatively crowded with rigs closer together than I would want for boondocking, obviously there were a few organized groups like the Airstream and a FMCA group. Closer to S22 in some of the larger parking areas rigs were further off the road than the rules state, but still too crowded for my taste. Did not see many rigs near the bottom of Rockhousenrd, did see a few that had followed one of the side roads that were spread out but camped pretty close to the actual side road or spur from the main road. Thanks very much indeed for the report. Sounds like most of the space to the right of Rockhouse Road is still open for boondocking which is good to know. And also nice to know there doesn’t seem to be any draconian enforcement going on. Thanks again! Actually there is enforcement of the ban on camping in the PRIME area used by boondockers for many decades which was the primary focus of my comment. The other rules such as a thirty-day limit, etc, are being enforced and I have no serious problem with that. You too missed the focus of my comments. THE most popular area for camping, with the easiest access, hard-packed sites and best views, was purchased by the Anza-Borrego Foundation and given to the Anza-Borrego Desert State Park on the condition that it be BANNED from use, a violation of the Park’s Charter which is to promote and support camping. You are totally right. The area where we’ve boondocked all previous years (up on the ridge) is totally gone. That’s been confirmed by multiple people. I guess I was just happy to hear there’s still spots in the “valley” area between Rockhouse and the ridge, coz I was worried it had ALL been blocked off. So, the situation was better than I originally imagined (I really imagined the worst), thus my rather optimistic comment. I too have no problem with 30-day limit. But your point is well made. The prime spots, where we’ve always camped in the past are totally gone. That is very sad, and totally against the spirit of the park charter. the PRIME spots, preferred by most campers. Yes. there are other spots. Have fun. John you are probably correct, not having been there before, I didn’t see many hard packed areas more than a mile or so from S22 that had boondocking, there were several areas that we didn’t consider for fear of getting stuck in soft sand. I tried to describe it to a friend who has been there before and she also agreed that it seems like the area they love the most is no longer available. Stayed in this area in late Nov 2015. Have been staying off of Rockhouse Canyon for several years now and was sad to see that the park has blocked off many of the old sites. We got discouraged and almost gave up. About 2 miles in, the new park boundary ends and there are a handful of sites as the road splits to the right. Several were big-rig friendly. We were approached by a local landowner who appeared to live in shipping containers about a 1/2 mile away and said that we were in a no-camping zone. He was not being honest and just didn’t want us there but didn’t bother us again. Our stay was uneventful and we actually got some snow on the surrounding peaks. While there, we scoped out some boondocking sites in Blair Valley about 30 minutes away on the S-2. Good info. I know exactly the area you’re talking about (near the containers). It’s too soft for the likes of us, but it’s a good possibility for lighter rigs. Thanks for reporting back!